This week is National Pet Week, and the American Veterinary Medical Association is encouraging pet owners to change your Facebook profile picture to a picture of your pet. This column is by Judy Clabes, editor & publisher of KY Forward. I am by DNA a dog person; I can’t explain how that happens, but there are just some of us born naturally drawn to dogs. It’s a sweet fate. My first dog was, in fact, imaginary. The last thing my young parents needed was a dog and a child so I had to make do. His name was Nipper, and we were inseparable. Ah, the joy of conversations with a perfectly attentive and infinitely agreeable listener. Description of a dog, imaginary or real. 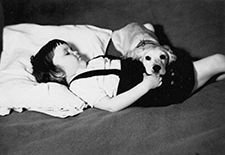 It was the beginning of a life that would be enriched and blessed – and defined by unconditional love and devotion of, by and for special canines. I know I am not alone. Dog people the world over understand this. I got my first real dog the Christmas of the year my sister was born. I was 4, and I think my parents felt they needed to give me some kind of consolation prize for bringing a baby into my exclusive territory. (I never told them it wasn’t necessary; I adored my little sister.) I adored the dog too. When I peered on tip-toes over the edge of what seemed like a gigantic box – I remember it as if it were yesterday – all I could make out were a pair of big floppy golden ears and big liquid brown eyes. I fell into them, a beautiful love-at-first sight. Aptly named Curley, that sweet, loving Cocker Spaniel and I were the best of friends and companions. My best friend indeed. The pain of his loss eight years later is as keen today as it was all those years ago. How could a small human being have so many uncontrollable tears? Judy and Curley, finally a real dog. For a few years afterward, my family had dogs shared by all of us; our mom really liked dachshunds, those cute temperamental wiener dogs, and I happily shared in the family connection, though I must admit the breed wasn’t my favorite. But it wasn’t until my new husband and I, seniors in college, decided to take the plunge that we found ourselves journeying to a horse farm in Lexington to take a look at some new puppies. One of them picked us out right away and there was no turning back. Shannon the German shepherd puppy became our loyal companion. We sent out birth announcements which mildly disappointed our parents. When our son was born five years later, Shannon, demonstrating the enormous capacity for dogs to love their humans, took him in too and saw him safely through his first three years. 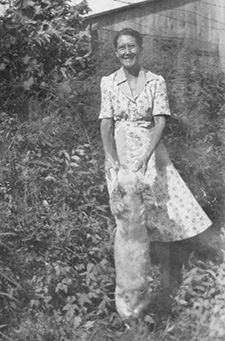 By then we were living on a small horse farm in Henderson County, where a succession of dogs shared our lives, notably a beautiful dalmatian named Jinx. The name, unfortunately, proved apropos as she met a untimely death with a piece of farm machinery. This was a terrific blow, as our dogs generally lived long and happy lives. Then, magic happened. Or fate. Whatever it was drew us to look at a giant of a dog, a Great Dane. I was pregnant with our second son at the time I met the most magnificent creature I had ever laid eyes on. She was a six-month-old harlequin, and for me, it was an instant attachment too deep to be denied. Somehow I was the human Brandy was meant to have and she laid claim. I couldn’t have turned away if I had been inclined. She was good to – and protective of – the whole family, the best babysitter two little boys could hope to have. But she was mine, unequivocally. Years later, when no amount of vet care or my earnest prayers could save her from a dreadful disease, she suffered through a long night, waiting for me the next morning to say goodbye, her head resting in my lap, her eyes locked on mine. Trusting and loving as she drew a final breath. How could a grown woman have so many uncontrollable tears and how could they come years and years later? Even now. The pain of this loss is keen and unrelenting. Sweet memories waft through, and the grief too. Our family has had dogs, of course, and I shared in them and the sweet companionship. But for me there loomed the bittersweet memory of my Brandy. There were Bert the rottweiler and Abby the blue heeler who stand out and brought us much joy. They lived long and productive lives, protecting the farm boundaries with a vengeance – and me when I was alone there in a remote place, safe and secure in their care. They “belonged” to the family but they took very good care of me – and they were the ultimate “odd couple” of fast friends to boot. I would swear to this day they understood every word said to them. Patches was a force of nature. 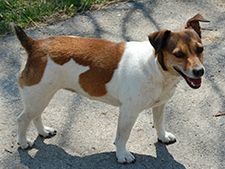 There was also Patches the Jack Russell who was a special and distinctive personality, providing both love, entertainment and frustration (she liked nobody but family in any way). The grandkids and I regularly take flowers to her grave, on a peaceful spot on the farm. We know she’s happy there, surveying her kingdom and still protecting the few humans she had any use for at all. All these special dogs embraced a next generation with the ease and loving hearts that define family. They seemed to know instinctively how to make the connection. Over the years, I resisted kind offers from my husband and sons to find “another Brandy” for me. But I couldn’t get beyond the lump in my throat or sense of loss that told me there wasn’t another one. I’m just not ready, I’d say. There’s no replacing her, I’d say. It just wouldn’t work; it’s best not to try. Then, nearly two years ago, on my birthday, there came a special surprise for me, minus the gigantic box. Having searched the world over, my special family tracked down the perfect Harlequin Dane puppy. I often slip up and call her Brandy, the memories are so powerful and she is nearly a mirror image, but she has her own name and her own personality. Ginger and I had no trouble connecting, love at first mutual sight. 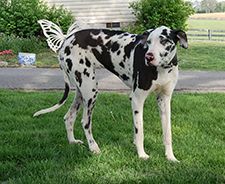 Ginger, the Great Dane, quickly became an important part of the family. There’s no explaining how this can happen. Dog people know. For me, I really do believe in magic. She came to me a puppy who could fit albeit briefly in my lap. At nearly 2 she’s a gentle giant of a still-puppy whose heart is bigger than she. She brings me joy, unmitigated. She owns me, heart and soul. I think she knows a dog person – or unconditional love — when she sees it. Brandy may come to the tongue at times, but I don’t think of Ginger as a “replacement” but as another special dog who has come into my life to enrich it and to remind me that unconditional love and loyalty is real and deep and abiding. Qualities we human beings can learn from these special of God’s creatures. Now that I have Ginger in my life, I really don’t expect to think about another dog, ever. I have been blessed with the best of canine friends. I have known the joy of that blessing. And I have known the pain of grief and loss that comes with it, as is life. With luck and God willing, my sweet Ginger and I will see this relationship through to the end together.